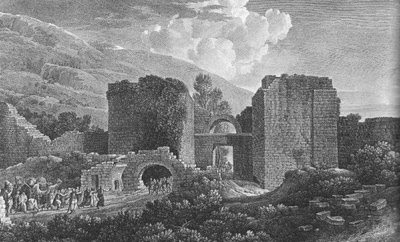 Antioch had many gates and most have been lost in the course of time. 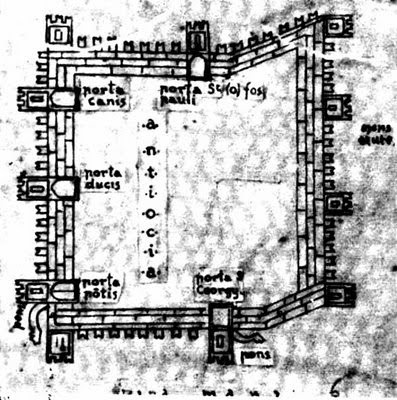 The Vatican manuscript (this time in Stinespring's translation): "Then they gave attention to the gates of the city, and the place where its enemies would descend against it. And they joined together a section of the wall on the western side of the city (this being the wall) which passed outside the city. And they connected to the wall a place of recreation (built) upon arches. And this bridge was fashioned to separate this quarter from those (other) quarters. And they built, for the city, three gates: one on the north, another on the east, and the Bridge Gate, commonly known as a the Sea Gate. And the bridge (at this point) was formed with arches." Uggeri in his note L'urbanistica di Antiochia sull'Oronte refers to the Bridge Gate as the Philonauta Gate. The other sources which we have seen that call it thus include Bouchier in his Short History of Antioch and Muller in Antiquitates Antiochensis and these are based on Malalas' reference to Theodosius' rebuilding of the walls, " Imperator itaque jussit, mi aedificia etiam quae extra urbem posita erant muro cingerentur : murus ¡taque factus est, a Philonauta quam vocant Porta Rhodionem usque dictum locum." Below is a very stylised map of the city of Antioch. This is a map from the 13th century (no4, 939) from the Bibliotheque Nationale de Paris. It shows five gates to the city. These are clockwise from the top, the Gate of Saint Paul (Porta Pauli), the Gate of Saint George at the bottom, the Bridge Gate (which leads to the main Roman bridge), the Duke's Gate (Porta Ducis) and the Dog Gate (Porta Canis). 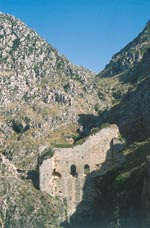 The only one of these that survives in its original form is the Iron Gate (in Arabic Bab al-Hadid) , which is located in a pass high above the city and is really a form of dam that was constructed to control the torrents of the Parmenios River when it flooded down through the City. It is shown in the photo below. The Saint Paul Gate (Bab Boulos) survived into the 19th century almost intact. This had originally been the Beroea (Aleppo) Gate. In Ottoman days it was known as Bab al Faris (or the Knight's Gate). The denomination as the Gate of Saint Paul came from its proximity to the Monastery of Saint Paul with its associated church. This monastery was otherwise known as Dair al Baraghith (or the Convent to the Bugs.. or Fleas). It was demolished for no good reason (except the looting of its materials). 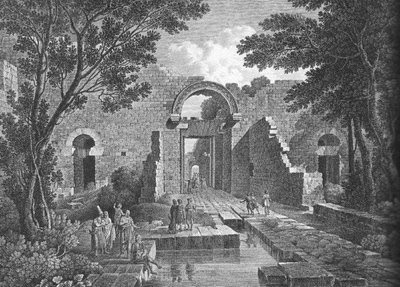 The engraving directly below, done between 1784 and 1787 by the French artist Louis-Francois Cassas, shows it a few decades before its demolition. It is interesting to note the pool of water in the foreground. There was supposedly a spring associated with this gate (possibly also the spring named earlier for Olympias, the mother of Alexander). The traveller, Tinco Martinus Lycklama, in 1866 records of the aforementioned spring: "Nous nous reposâmes une demi-heure auprès de la belle fontaine que les Arabes appellent Aïn-el-Taouil (la Longue) et qui se trouve en dehors de la porte ombragée par un platane gigantesque sous lequel un cafetier turc s'est établi, dans un enfoncement occupé jadis par le gardien de cette entrée". The image above is a view of the gate from outside the walls. As can be noted the condition at the time was remarkable considering the wars and earthquakes and ravages of 1800 years of history. Joseph Francois Michaud in his letters written in Antakya in 1831 recounts seeing a gate nearby (described as being much smaller and no more than "five or six steps from that of St Paul) being demolished. Michaud also relates that the gate was 30 feet tall and some 12 feet wide. This corresponds with what one can see in Casas' etchings. The gate of Saint Paul was apparently damaged but not badly in an earthquake in 1822. Forster recounts that Ernest Chantre in April 1881 saw the gate of Saint Paul being demolished. Its stones were reused for the construction of minarets and houses. Forster claims it was badly damaged in the earthquake of 1872. William Ainsworth in his 1842 report of his visit to the city speaks of virtually nothing except an inscription he found on the "north tower". He included the above illustration. We feel that this may be the Porta Canis. It would be great to confirm that it was the latter as we have no images of this structure in its original format. The depression in front could be the old riverbed of the silted up branch. Forster in 1898 reports that the gate was dismantled and its parts had been reused to build Ibrahim Pascha's notorious barracks (which were the ruin of many a solid Antioch surviving remnant). The Porta Canis (in Arabic Bab el Kelb) features in history as one of the main points of assault in the First Crusade. At that time the bridge connecting to the then defunct Island was still in existence. The Orontes branch had silted up by then but the old ditch had become a swamp. In 1934, the excavations revealed the bridgehead of the old bridge at the Porta Canis. We have a special posting on this Gate. But the city had considerably more gates in its prime than this map of around AD 1300 would indicate. The St. George Gate (Daphne or Golden Gate) was in the outer wall. Downey comments on Malalas' account of the work of Theodosius II at Antioch Malalas says (p. 360, 15) that that emperor also " gilded the two bronze leaves of the Daphnetic Gate in the same manner that he gilded the gate at Constantinople which is still called the Golden Gate." The famed Cherubim Gate in the inner wall in line with the Daphne Gate on the outer wall. Downey wrote an extensive essay on this gate. It was located near the Jewish quarter and was reputed that Titus had erected the Cherubim (or copies thereof) looted from the Temple in Jerusalem affixed above the gate, hence its name. Its location is still undefined. Then there must have been gates between the old Greek City and the newer parts. There were gates at the end of each bridge leading from the "mainland" to the Island and there was a gate, the Taurus Gate (Porta Tauriana) leading from the Island onto the bridge that crossed the main branch of the Orontes. It is interesting to note the comments of Catherine Saliou on this latter gate. She raises a number of reasons as to the gate's nomenclature. Some claim that there was a statue of the Seluecid king, Antiochus IV Epiphanos, taming a bull (or a calf) and that is where the name derived. Others claim it was because it was the gate faced the Taurus Mountains. Some think it is pictured in the Megalopsychia Hunt Mosiac, but Saliou points out that the PIANA (the only part of the inscription intact) may actually refer to a district named the Ovariana after the Senator, Varius. The gate may not have even been on the Island. It is generally felt though that it was associated with a bridge of the same name. Niebuhr is his book, Corpus scriptorum historiae byzantinae, quotes a passage from Ammanius Marcellinus relating to the year 378 AD. It says : "Hoc anno Antiochiae in porta, quae dicitur Tauriana, aedificata est ad pontis latitudinem, tectoque operta: item parva basilica in veteri prope maiorem extructa". Ernest Babelon in his comments on the Greek coins of the Syrian kings comments "nous savons par Libanius , que la ville d'Antioche était ornée d'une statue de bronze représentant le roi domptant un taureau : on l'a vu plus haut, ce monument fut élevé, d'après le rhéteur byzantin, en l'honneur du mont Taurus expurgé des voleurs par Séleucus. C'est sans doute le voisinage de cette statue qui fit donner le nom de Tauriana porta à l'une des portes de la ville, à l'époque romaine. " Theophanes in his Chronicle of the year 385-386 AD states "In this year, at Antioch, an extension was laid out to the gate called "Tauriana" up to the width of the bridge, and this extension was covered". If indeed this bridge/gate complex was near the Palace then some exposure of the main avenues of the Island through reactivated excavations would presumably lead to the bridge and some definitive remains could be uncovered. This matter of the nomenclature of the gates get complicated. Some are clearcut as we note above but others may refer to the same structure with differemt names over time. An example is when Forster writes of a gate called the Romanesian Gate. He quotes Malalas in that this structure had a statue of the High Priest Amphion displayed within it. This Amphion was the one who supposedly sacrificed the virgin Aemathe at the founding ceremony of the city under instructions from Seleucus Nicator. "Amphioni etiam sacerdoti , quicum auspicia ipse captaverat, Seleucus columnnam posuit marmoream , intra portam , Romanesiam dictam".Forster describes this as standing on the "river side" of the city. Its not clear if this was the Bridge Gate or another one. This gate also features in Palladius' life of Chrysostom in which Eutropius whisks the bishop out of the Romanesia gate and into a conveyance for him to head off to greater glories in Constantinople. A contrast of two high priests! Forster relates that Cassas interchanged the last with the East Gate and Ritter used the name on the St George's Gate. Also, the Prince's gate was was also known as the Gardens' Gate (Bab al-Ginan / Bab el-Jeneneh) both in Yahya's chronicle from XI century and in the map of 1912. Where are these precious original paintings and how do they know they are original and not the first copy of them?